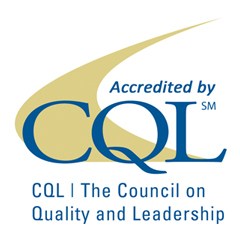 Long before LCE first became accredited by the Council on Quality and Leadership in 2010, we were using the concepts of CQL’s Personal Outcome Measures (POM) tool as a way to provide individualized supports to people by asking the rights questions. We take what we learn from these interviews and make a plan with the person based on what they say they want for their life. This kind of plan is the most meaningful and most successful way to help people design (and redesign as needed) their life. We believe the best way to build this plan is to listen to the expert – the person! POMs, along with Person Centered Thinking and DBT, are an important part of how we go about providing supports to people. Each LCE staff is given an overview of POMs and each person we support is interviewed using this tool. POMs are not just a way to learn about people but also to show us as an agency how we are doing. We use data from POM interviews and each of the 21 “Outcomes” as basis for quality improvement. This quality measurement is based on each person’s expectation for success, in areas of their life that are important to them, which helps us keep focused on what is most important.